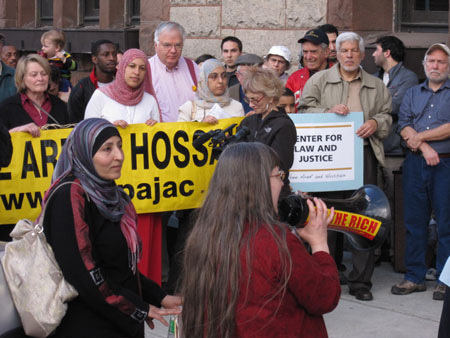 It all started with The Wife’s involvement with the obviously bogus entrapment and convictions of Albany residents Yassin Aref and Mohammed Hossain by the Federal Bureau of Investigation (FBI.) Soon she found herself writing to the men in prison and visiting regularly with their widowed families here in town. 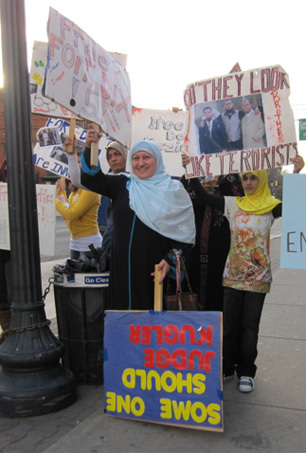 Next thing you know she’s been visiting and talking with families of other Muslim men in places like Newburgh and Philadelphia who have also fallen victim to the machinations of the secret police. 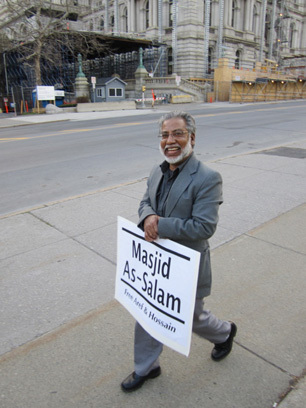 So earlier this year The Wife, along with her co-conspirators at Project SALAM (Support And Legal Advocacy for Muslims) came up with the idea of asking the City of Albany Common Council to pass a resolution asking President Obama and Attorney General Eric Holder to open an investigation into the ongoing entrapments and prosecutions of Muslims. Project Salam has uncovered hundreds of these phony baloney “terrorism” cases, every single one of which brought convictions without physical evidence, on hearsay alone. They have yet to find one convincing “terrorism” conviction. And it is starting to look like there are hundreds more cases of entrapped Muslim scapegoats out there that hardly anyone has heard about. “They’re coming out of the woodwork,” she says. As far as she knows, such a resolution passed by the Albany Common Council is the first one of it’s kind, another first for our City. Let me stop right here and clarify an important point. If there was any actual evidence that any of these Muslim men were actually plotting to kill fellow Americans and destroy public property - you know, recorded conversations, credible witnesses, recovered weapons, documents, fingerprints, DNA, that sort of thing - then I would be the first to demand that they all be hung from a lamppost and fed to pigs. I mean that literally. So far, it looks like I’m not going to get the opportunity to make that demand. It looks to me like the real terrorists are operating out of the FBI fortress on McCarty Avenue. If the secret police consistently get away with perjuring hapless Muslims into political prison, then where and when will they stop? Who among us is safe from the lawless FBI? The Wife lobbied the Common Council representatives for weeks, meeting with them at odd times like 7 in the morning and in various public places. 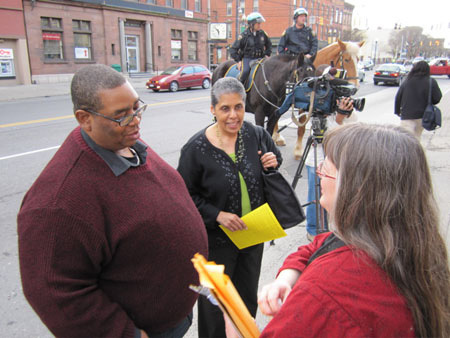 By the Common Council meeting on April 5 it looked like the resolution had enough votes. But The Wife knows better than to count her legislative chickens before they cast votes, she’s learned the hard way that legislators routinely leave their voting options open right up until the last moment. All true politicians, whether we’re talking about legislators, mayors or judges, only do what someone tells them to do. Ideally, they listen most closely to the bosses who can fire them from their jobs, the voters. But all too often the voter bosses are absent or passive or scared or too lazy to pay attention, so the politicians end up listening to corporate exploiters or to more local crooks and gangsters. The Wife is well aware of this fact, she knows better than to depend upon politician’s promises. 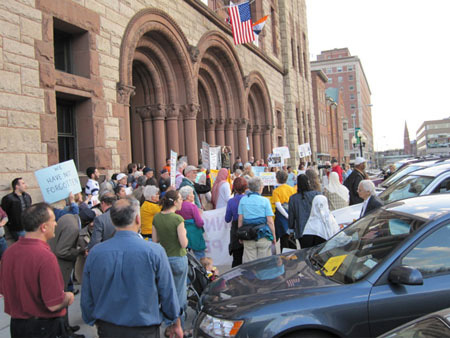 Thus, immediately before the vote in the Common Council, she organized some concerned citizens into a march upon City Hall. Fatima is traditional, at all times she wears a full length black gown and hajib that only reveals her eyes and part of her forehead. Thus I can’t tell you what she looks like, I usually recognize her by the flour and paint stains at the bottom of her gown. The Wife tells me, “I don’t understand how she stays in business, selling pizza at $1.50 a slice.” Like her imprisoned husband was, she is much in the habit of giving away her food to the neighborhood indigents. During the march Fatima stayed back at the shop working like she always does, but she joined with everyone later at City Hall. Eventually I counted about 120 people who marched down Washington Avenue. 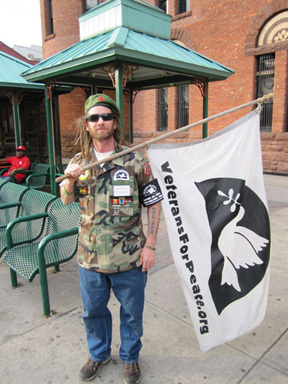 This included a core group of the usual activists and troublemakers, along with visitors from far away. I observed a fair number of passersby stop, ask what this was all about, and then enthusiastically join the crowd. 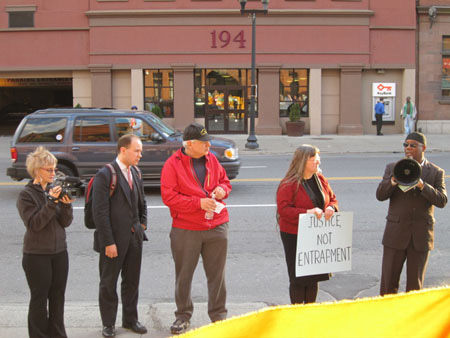 The Wife received invaluable help from Albany County Legislator Doug Bullock and his famous “Tax The Rich” bullhorn. I don't think she could have pulled this off without Doug, who selflessly offered his extensive organizing skills to Project SALAM. He’s a labor organizer who has instigated and coordinated thousand of rallies and demonstrations, plus he has a real knack for bringing the right people together at the right time. Now, Doug is not a natural politician, he's a real basic guy. He’s helped organize so many rallies that when he’s out on the street in front of a crowd he tends to behave like he’s at home in his living room. 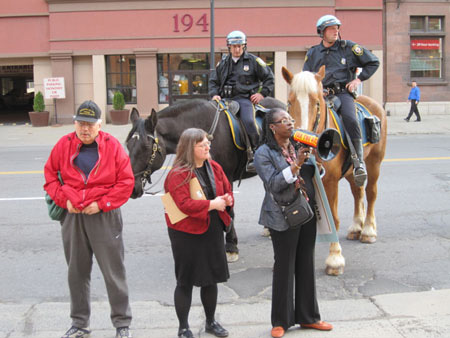 For instance, I spotted a potentially great photo of Doug, The Wife and Alicia McWilliams from Newburgh, and behind them the two mounted cops. By the way, these bored cops were the only ones assigned to this event, that’s how respectable all this stuff has become. Here we were, listening to these solemn stories of entrapment and persecution, the media in attendance, and at the very center of attention here is the Honorable Doug Bullock grimacing and apparently trying to untwist his underpants. I swear I stood there for five minutes waiting for him to stop, I wanted to throw a rock at his head. I never did get that great snapshot. Alicia is very upfront about her own past, which, she told us over breakfast that morning, is why she is not ashamed or afraid to stand up for these young men. Her nominally Muslim nephew, she tells us, was scamming around for money when an FBI agent provocateur lured him with a promise of ten thousand dollars if he performed some sort of scheme. At one crucial point he was instructed to meet someone and say the code word “jihad” several times, this moment was duly recorded and blown up into an act of “terrorism” for the media. This poor sap and his codefendants are a far cry from the clean living young folks from suburban NJ called the Fort Dix Five, or the very respectable and much admired Dr. Rafil Dhafir of Syracuse. But I say, labeling ex-cons living on the margins of society “terrorists” and parading them through kangaroo show trials does not help us more respectable citizens sleep safer at night, on the contrary. 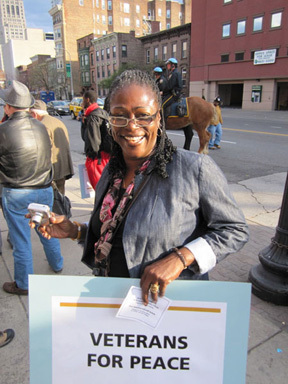 Besides the honorable Doug Bullock we had four members of the Albany Common Council at the rally. Besides Mr. Calsolaro of the 1st Ward there was Barbara Smith of the 4th, who has taken a deep interest in the cases of Yassin Aref and Mohammed Hossain since the beginning. From what I understand, Ms. Smith has been frustrated by the apparent lack of action on this issue, she is one of many people who have “come out of the woodwork” to support The Wife’s initiative and help carry it further. The Wife was surprised and delighted when Ron Bailey of the 3rd Ward enthusiastically lent support to the pending resolution. “Oh yeah, I’m with you on that,” was his immediate reply when The Wife brought it up with him. 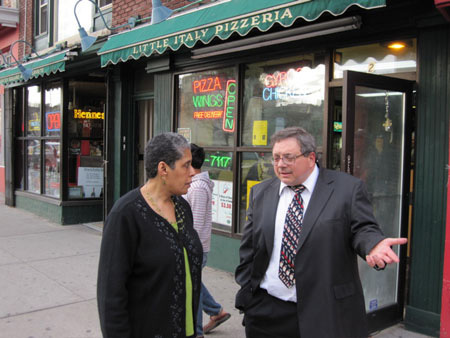 It turns out that he represents the growing Muslim community settling behind the south side of Central Avenue, and his ward includes Little Italy Pizza. Like most people in the neighborhood, he knows Fatima well and respected her husband before he was entrapped and incarcerated. Anton Konev of the 11th Ward showed up with his trademark suit and backpack. Mr. Konev has a keen interest in the plight of immigrants, having himself emigrated to this country as a teenager from Russia. Thus he was also easy to convince, like Ms. Smith and Mr. Bailey he is a cosponsor of Dominick’s resolution. Lots of media were present, but reportage was spotty. Metroland did the only good print report that I saw, and oddly enough the only TV segment I could find was Channel 13 news. (I’m told that all the jerks who picked on me back in 2003 no longer work there, so I guess I’ll have to stop badmouthing 13.) I’m guessing most of the media managers quietly killed the story of the march and resolution as too politically incorrect, who knows but maybe the FBI gave them all a call. With the secret police I’m ready to believe anything these days. Right on schedule the crowd formed up and marched down the sidewalk of Washington Avenue to City Hall. The two cops on horses led off to one side in the left lane of the roadway, fortunately traffic gets light after 6 PM. I have to hand it to those guys, they did the absolute minimum to keep access clear and left the organizers to keep the respectable crowd orderly. Outside City Hall there were more short speeches, more stories told while waiting for the Common Council session to start. 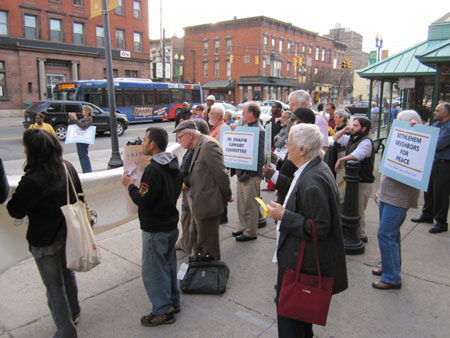 This was the moment when the crowd started to get a sense that something historic was happening, that the City of Albany was about to take the lead on an issue that runs silent and deep. We were all here to try to head off a torpedo aimed right at the heart of American freedom. Actually this is where I made my exit. I stayed to watch some of the crowd go through the unconstitutional phony baloney “security” checkpoint inside the door, including all the family members of these so-called “terrorists.” A checkpoint, I might add, that does not block access to the Auditor’s office, his staff or half the Treasurer’s staff, the entrance to which is a sharp left before the metal detector. 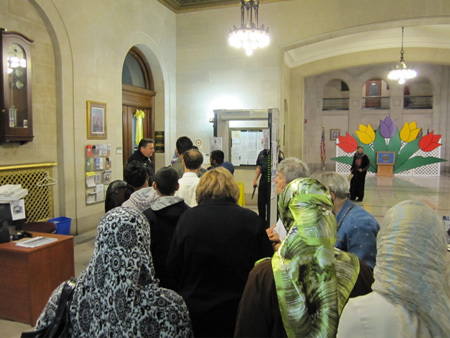 Aren’t these City financial employees at grave risk of terrorist attack? Or... could it be that the checkpoint serves no security purpose other than to harass and annoy the taxpayers? In any case, all these women wearing hajibs got in with no problem so the checkpoint didn’t do a very good job of filtering out potential terrorists that evening. The idea, you see, was to introduce the measure and vote on it that night. You can do that with resolutions, which are non-binding recommendations. In contrast an ordinance, which becomes an enforceable law, cannot be voted on the same night it is introduced. After that honest testimony none of them, not even old boys Igoe and Herring, could bring themselves to vote “no!” Contrary to my own expectations, we have a whole new ballgame on the Council, it appears to be no longer composed of the Mayor’s minions versus the minority progressives. If this vote is any indication, the new majority votes according to the merits of each measure rather than for or against The Mayor’s will. We’ll see if that continues to hold true. Okay, so this is the first resolution of it’s kind in the nation, but so what? What’s the big deal? 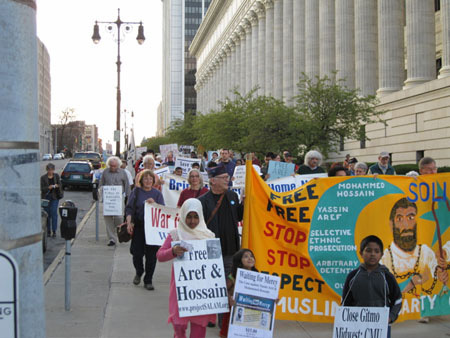 First off, various observers agree that this is the first time that American Muslims, both natural citizens and immigrants, have dared to publicly protest the ongoing FBI campaign of terror being conducted against them. Up until now the FBI campaign, which has been designed to isolate American Muslims and make them feel powerless, has been very successful. This public display directly undermines the scheming of the secret police, whose political power over the citizens depends upon secrecy and misinformation. Second, this could be the start of something big. Attorney Steve Downs has been suggesting that this could be the beginning of a national movement to get local municipalities to pass similar resolutions. He wants to start with some nearby Cities and suburban towns, and continue from there. This is not far-fetched, we did it once before in open defiance of the obnoxious “PATRIOT” Act, the anti-American statute that “legalizes” clandestine surveillance of citizens, does away with effective warrants, and allows indefinite detentions instead o proper arrests. In other words. it is an attempt to legislate away the US Constitution, an attempt that almost succeeded. The “PATRIOT” Act is still on the books, still enthusiastically maintained by the Republicans and their subservient Democrats. However, 414 anti-PATRIOT Act resolutions have so far been passed nationwide including several states and New York City, Chicago and Los Angeles. This incredible campaign defied and shattered the corporate media censorship, educating millions of Americans about this attempt by our idiot federal politicians to overthrow our Constitution. By the way, it’s no coincidence that Dominick Calsolaro introduced the original “PATRIOT” Act resolution into the Albany Common Council. The latest word is that Project Salam is establishing close ties with the Bill of Rights Defense Committee (BORDC) with the object of launching a new campaign of local resolutions. Like the old song from World War Two says, “We did it before, we can do it again.” As long as we are all breathing we can and will do our part to keep the US Constitution alive. We will not sit quiet and scared and alone waiting for the secret police to disappear American Muslims... and then come for the rest of us. 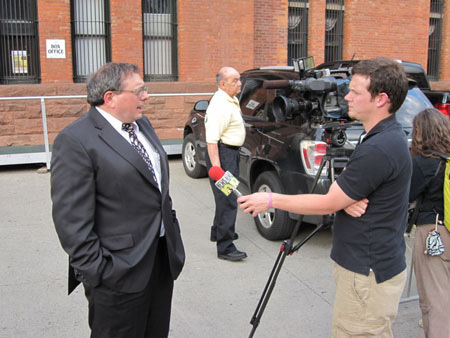 Watch the two part video of the April 5, 2010 Common Council session, courtesy of Albany Community Television (ACT) and read the text of the resolution here.